Each property – house, villa, apartment or holiday complex - has different and specific needs, depending on the region and location, type and size, owner personal requirements. Maintaining a property abroad require a local knowledge and experience. BHC Ltd will assist you in this mater. We afford you the opportunity to use our local property management teams. Renting your Bulgarian summer holiday home on the Black Sea Coast or in rural areas, in the region of Varna, Kavarna, Balchik, Dobrich, Byala, Obzor, Nessebar, Shoumen can be a hard work. Advertising your holiday home located in the Bulgarian beach resorts or your rural house is not as easy as it sounds, as you need an effective advertising and promotion of your property. 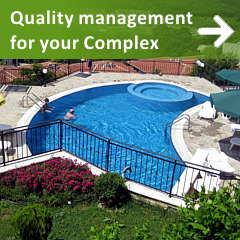 We provide all types of services concerning the management and maintenance of Holiday Complexes and common part areas. Our aims are to keep the Complex in perfect condition, so all property owners, their families and guests can have a splendid holiday in Bulgaria. Building and renovation projects management services - new building, reconstructions and all kind of repairs your holiday home may need. 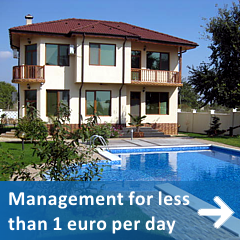 BHC Ltd is a Bulgarian Property Management and Letting Agency, servicing North-East Bulgaria and the Black Sea Coast. Below you will find all Municipalities, towns and villages where our services are available. The quality of our business can be seen by the outlook of our properties! Some of them are listed below.